The famed bat heroine, cat burglar and psychotic psychiatrist are teaming up. 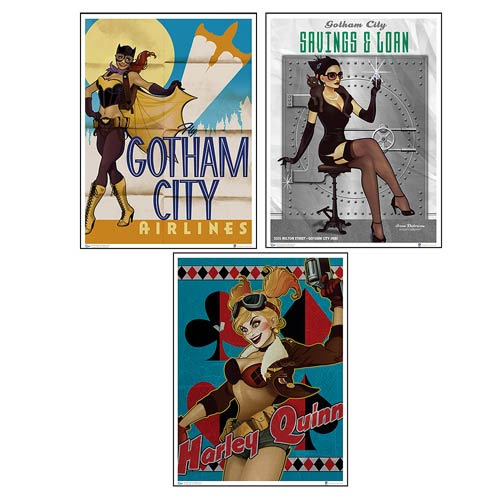 Normally sold as separate art prints, this limited-edition bombshell of a set features Batgirl, Catwoman and Harley Quinn together in the Batman DC Bombshells Gotham Art Print Set for one low price. Batgirl highlights Gotham City Airlines with a winking reference to the Bat Signal. Catwoman luxuriates with jewels in a bank vault, accompanied by her cat Isis. Harley Quinn, affable and deranged as always, is primed to create chaos. DC Comics Bombshells is DC Collectibles' line of statues featuring the female superstars of the DC Universe in looks and poses inspired by classic pin-up art. The art prints from QMx offer fans a chance to own beautiful reproductions of the original DC Bombshells artwork designed by Ant Lucia. Each print measures 18-inches wide by 24-inches high. Set of 3. Ages 14 and up.